The area of Kinashi and Kokubunji town in Takamtsu city in Kagawa is biggest bonsai-producing area, occupying about 80 percent of pine bonsai market. 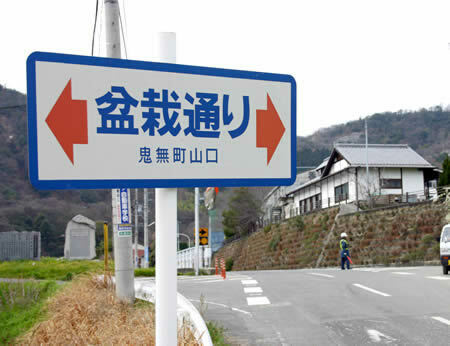 In Kinashi, there are 78 members of Kagawa Kinashi Garden Plants and Bonsai Center (President: Keiji Kandaka). The number of members is decreased at 60 percent from the start in 1974. However, still now, it keeps the tradition of Kinashi bonsai of 200 years. The sloping road is called "Bonsai street" from JR Kinashi station to Kagawa Kinashi Garden Plants and Bonsai Center next to Takamtsu Nishi high school. There are many bonsai producers along the street. 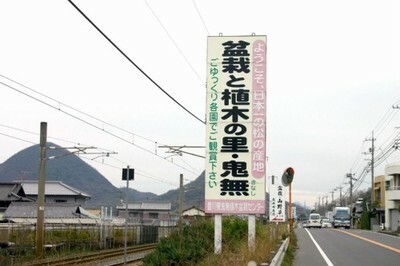 In addition, there are many bonsai fields near the street, Kinashi elementary school, and JR Kinashi station. An auction market in the Bonsai Center is held every 5th, 15th, and 25th. There are many kinds of trees such as pine, Zoki (deciduous tree), fruits and flowers. Some fanciers visit the event from Shikoku, Hiroshima, and Shizuoka. All members who pay 25000 yen including the registration fee and commission can participate all auction for 72 times in 2 years. In the 3rd year, members have to pay 3150 yen to renew. 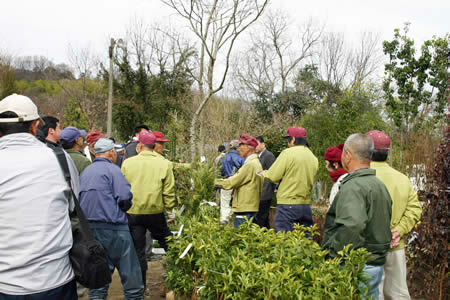 Many bonsai fanciers visit the auction market of every 5th, 15th, and 25th at Kagawa Kinashi Garden Plants and Bonsai Center in Takamatsu's Kinashi town. Presiden Kandaka worries about the seriousness of the current situation of local product like bonsai, stone, and so on, and says, "Bonsai has been honed the spiritual and cultural style in the long years. So I think it will be reviewed as healing in the coming years. I try to promote the attraction of pine bonsai assiduously. In the professional magazine, it is said Kuromatsu boom is coming back. A short while ago, trees of flowers and fruits are more popular than pine because of the easiness. So people are interested in the coming back of king of bonsai. A signboard promoting "Kinashi, the hometown of bonsai and garden plants"
In addition, Asia-Pacific Bonsai and Suiseki Convention and Exhibiton will be held inTakamatsu in 2011. Kandaka says, "It is historic feat to hold the Asia bonsai convention in the local city."